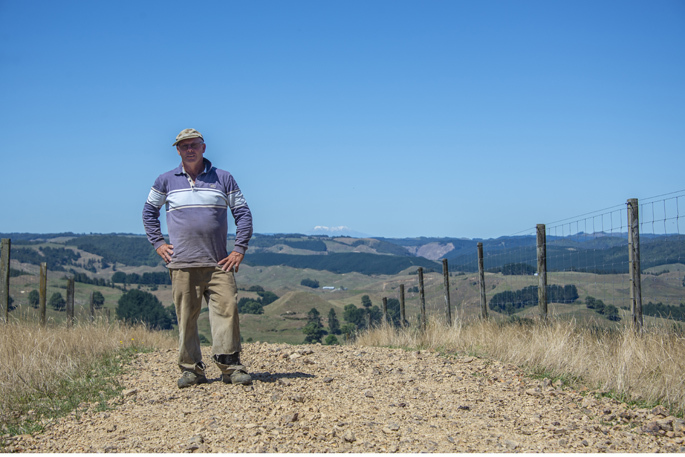 Murray Templeton on his family’s Rangitoto farm. Murray and Heather Templeton are second generation farmers on the Templeton family farm near Rangitoto in the King Country. The family have run the 320ha property since 1951. The steep rolling contour of hills, combined with wetter, lowland areas, means the farm has a varied list of environmental factors to take into consideration. Under the Healthy Rivers/Wai Ora: Proposed Waikato Regional Plan Change 1, the property is within a priority 1 sub-catchment area. This means their Farm Environment Plan must be completed by 2020, and all stock excluded from waterways. The farm’s stock is mixed and, as Murray explains, each animal type contributes differently to environmental issues. The farm winters 1200 red deer, with around 550 fawns being born each season. Deer utilise all areas of the land, and they effortlessly use the steep slopes regularly. “Deer are known for tracking, using the same paths all the time, and tracking up and down fencelines, when unsettled. To compensate for this type of erosion, the couple have planted poplars and willows on the sidelings. While the roots bind the soil, the leaves have the added bonus of providing shade for the stock. As well as starting with three-metre-high young trees, Murray has fashioned cylinders of concrete reinforcement grilles secured with three waratahs. The deer still nibble what they can reach but the trees survive. There are several waterways coursing through the property and all the main ones are already fenced off. The economic viability of fencing the waterways in the required timeframes is also pertinent for the Templeton farm. Further fencing will be carried out, plus installation of Novacoil drain flow systems. One larger waterway has been lined with willow trees. The 450-500 Wiltshire and composite ewes, and the 650-plus lambs each season, are probably the kindest to the land. Mature stands of naturally grown kahikatea are dotted throughout the property, offering valuable shade. The Templetons view their FEP as an ongoing document, not one that will end at the Healthy Rivers Plan Change 1 submission deadline.